As the old adage goes "if you've been at the table for a while and you still don't know who the sucker is... it's you." And in the case of the US equity market, it is hard to argue with who the 'whales' are and who the 'suckers' are based on the following data. At the start of the year, when the impact of Trump's offshore cash repatriation holiday was just being felt, JPMorgan made a daring forecast: it predicted that buybacks in 2018 would hit a record $842 billion, a number that would put any prior year's total to shame. It also meant that as corporations themselves emerged as the biggest buyer of stocks in 2018, it would require an avalanche of selling to push the market lower. More recently, when looking at its client trading activity, Bank of America made another surprising observation: in the first half, corporations were the only net buyers of stocks (with the only exception of companies in the Industrial sector), as institutions and hedge funds have been net sellers throughout 2018. And while we were originally skeptical that JPMorgan's forecast would be validated, the latest official data blown all our skepticism out of the water. According to TrimTabs, Stock Buyback Announcements swelled to a record $436.6 Billion in the second quarter, smashing the previous record of $242.1 billion set just one quarter earlier, in Q1. Combined, this brings the first half total at a ridiculous $680 billion, or just $160 billion less than JPM's full year forecast. Annualized, this number amounts to $1.35 trillion, an absolutely staggering number. Putting the Q2 number in context, TrimTabs writes that "the amount of money committed to buybacks last quarter could fund 6.8 million $1,000 bonus checks to workers every single trading day." 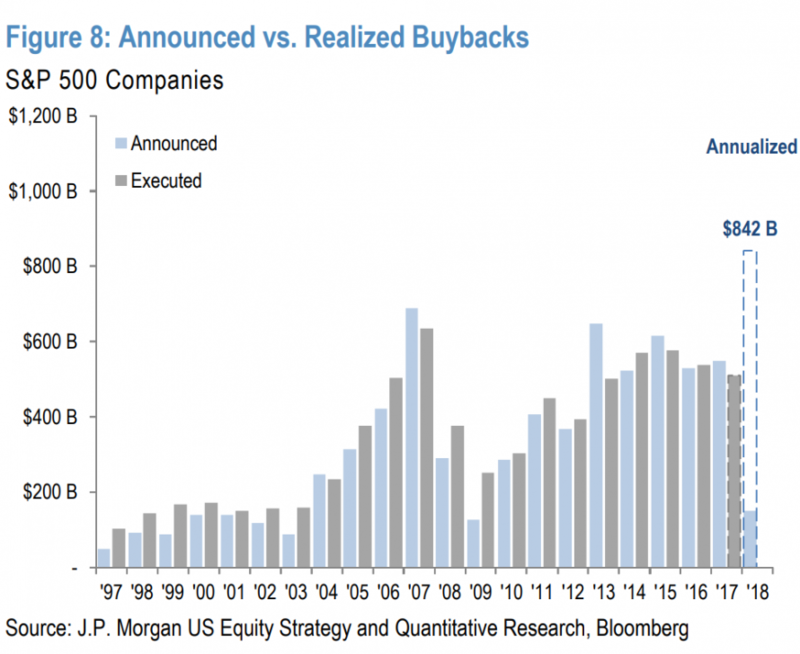 So, as we have noted numerous times, the 'demand' side of the US equity market is dominated by corporate buybacks... and within that group, dominated by the Tech industry. 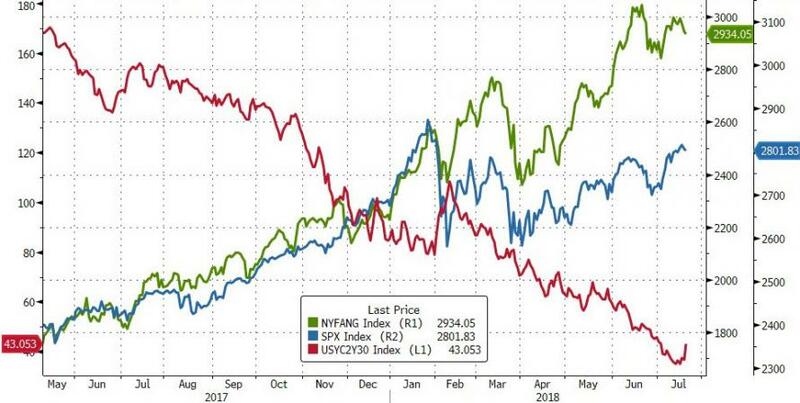 All of which perhaps explains why, amid a collapsing yield curve, crashing yuan, trade war turmoil, and geopolitical chaos, stocks soared, led by the mega-cap tech stocks. However, there's a dirty little secret lying just beneath the surface of this 'different this time' ramp in stocks. And even the SEC is starting to find this potential market abuse too much to ignore, as we noted previously, according to an analysis by SEC Commissioner Robert J. Jackson, Jr., company executives have been grossly abusing the timing of buyback announcements and selling significantly more of their stock immediately after the news than they do beforehand. taking advantage of price bumps that often accompany share-repurchase announcements. But what is most infuriating, is that this is perfectly legal, and as the WSJ reports in a speech on Monday, a pissed off Jackson — appointed by President Trump and sworn in this year to fill a Democratic seat at the SEC — may emerge as the most credible SEC employee in years when he urges fellow regulators to review securities laws that provide protection to insiders who capitalize on the timing of buyback announcements. This is where it gets bizarre: while companies engaging in buybacks have certain constraints, such as following a blackout period, or only selling on a NBBO uptick, insiders who sell stock into buyout bounces aren’t trading illegally and Jackson isn’t accusing them of that. But these price surges can be especially beneficial to corporate executives holding large chunks of corporate stock looking for an uptick to unload shares. 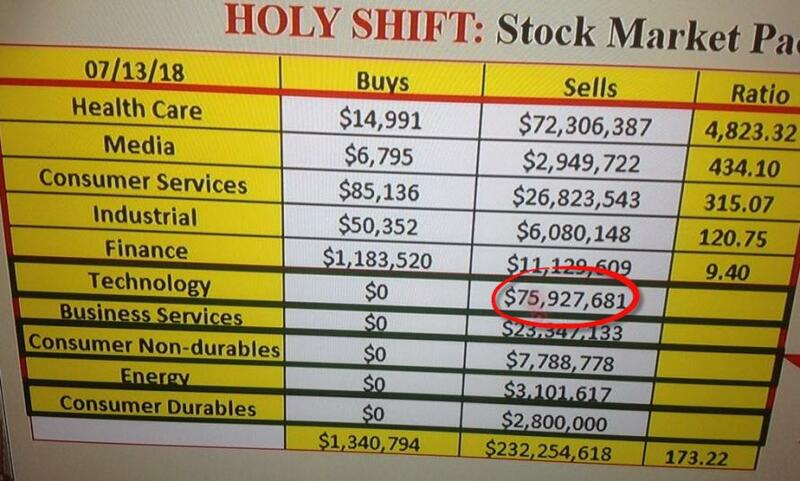 And since it is the executives that decide when to buy back stock and when to announce it, it seems that this is yet another way for corporate insiders (literally) to skew the market in their favor. Oh, and the other difference of course, is that when the company, retail investors, algos (and central banks) are buying, corporate insiders - those who know their company better than anyone - are selling. Almost as if the market is being inefficient and not rewarding those with the best information. And yet that's precisely what the SEC has been doing for decades. Ironically, it is only a Trump-appointed commissioner who dares to blow the whistle. However, we suspect that this will never be allowed - since it remains the source of Trump's stock market (never mind enriching the anti-Trumpers at the top of the Silicon Valley sycophants).